This season, Blue Volleyball went through a rebuilding period after graduating three key seniors last year. But, despite the Blue’s 14-15 season record, there is strong optimism for the future of Blue Volleyball. 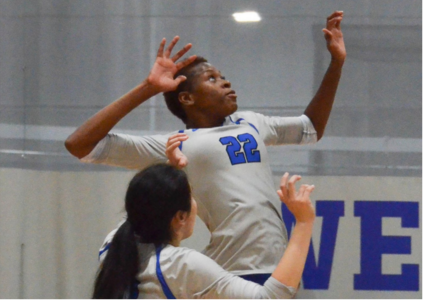 First-year middle-hitter Yasmine Reece, who hails from New Rochelle, New York, was named NEWMAC Co-Player of the Week for the week ending Oct. 25 after recording 65 kills, 15 digs and 10 total blocks in the four games of that week. Reece was the only member of Blue Volleyball to be named NEWMAC Player of the Week this season, and she led the team in kills helping the Blue win key matches against Smith and Brandeis. Her strong rookie season gives hope that the best is yet to come, and the next few years of Blue Volleyball could be some of the strongest years yet. Wellesley News spoke with Reece and learned about her true love for the game of volleyball and her belief that hard work really does pay off. Laura Brindley ’16 (L.B. ): Who or what inspired you to play volleyball? Yasmine Reece ’19 (Y.R. ): I always wanted to play because I remember when I was younger, there were “tall people sports,” and I was always tall. I wanted to play basketball and volleyball, so that’s why I decided to play it. L.B. : What made you decide to come to Wellesley to play volleyball? Y.R. : I knew I wanted to play in college, but I also knew that I wanted more of an academics-based school. I wanted a good balance between doing what I loved and getting a good education, so I came and visited Wellesley. I really liked it, so I decided that this was the place. L.B. : How is college volleyball different from high school volleyball? Y.R. : One thing that was completely different for me was the amount of time that I spend with the team. For high school, I would see them at practice and on the bus, and that was basically it. But here, I feel like I was with the team a lot more: we would eat together before every game, have lunch with recruits, and have team bonding activities the night before games. L.B. : What is your favorite workout or activity during practice? Y.R. : I just like playing. I like the end of practice when we scrimmage because playing is so much fun. L.B. : Do you have a pre-game ritual? Y.R. : I have to listen to music before every single game. If I don’t listen to warmup music, I will get really upset. I always have to sit in the back of the bus with my Beats and get in the zone. L.B. : What do you plan to do in the off-season to prepare for next fall? Y.R. : Lift. I don’t really like working out, but I have to do it so that I get better. Maybe I will change my diet because I feel that as an athlete I should eat better than I do. Also, definitely play more and touch the ball as much as I can. L.B. : What are some personal and team goals for next season? Y.R. : As a personal goal, I want to be at least number two in kills for our league. I want to be number one, but I feel that being number two is a solid goal. For our team, I want to win NEWMACs and eventually get to the NCAA Tournament and do damage there. L.B. : What was the highlight of your rookie season? Y.R. : We had a tournament here, and we played a bunch of schools from New York. One of them was Ithaca College, and one of my friends from my club team played for Ithaca, so it was good to see her again. They are a really, really good team, and I remember going into the game unsure if we could win, and we ended up beating them, so that was a fun game. L.B. : What is one word of advice you would give to an incoming first-year hoping to play volleyball here next year? Y.R. : You are going to get better. Give it your all and work hard, and you will see improvement. L.B. : Who is your favorite professional athlete? Y.R. : That’s hard. I want to say Blake Griffin and Serena Williams. Serena is a boss!